​Your dog is there for you through everything and is willing to do anything for you. Dog weight pulling activities are an incredible way to bond with your dog, but comfort and safety are key when you begin your newest bonding adventure. The type of harness you chose for your dog will depend on a wide variety of factors, such as the breed of your dog, his weight, the weight he is pulling, and the purpose of the harness. This list of the top seven dog pulling harnesses will set you, and your best friend up for success in your weight pulling activities. The Canine Equipment Ultimate Pulling Dog Harness wins for the best overall harness. The fleece lining provides comfort to pull with just the right amount of traction. The distribution of weight allows for even pressure across all the right areas. It is adjustable, allowing you to find the perfect fit for your dog. ​Weight pulling is a sport that has dog lovers divided. However, dogs have been accustomed to pulling heavy objects for centuries. Even if you aren’t a fan of weight pulling as a competition, there are many other reasons to outfit your pooch with a dog weight pulling harness--think daily chores for example. Check out Nordkyn’s Weight Pull Harness, which is recommended by the International Weight Pull Association. Nordkyn does not skimp on comfort by providing extra padding which allows the harness to be used for sledding and hauling as well as during competition. This harness comes with a spreader kit that will get you started in your weight pulling training goals. Bonus: Looking to pamper your weight pulling pooch, opt for the sheepskin instead of polar fleece! ​Cart pulling is a fun pastime for families and their dogs, as well as a fun way to compete with your dog. If you think cart pulling is just for the big dogs, think again, even little breeds love to pull for you. From pulling supplies while you work together, to the kids after school, cart pulling is an activity for the entire family. The best dog cart pulling harness goes to Fidogear’s padded cart pulling harness. It is manufactured specifically for this purpose, giving it an edge in the industry. It includes padded neck and chest straps to ensure comfort and even weight distribution. ​​When it comes to dog sled pulling harnesses, performance and comfort are at the forefront when choosing the right outfit. Alpine Outfitter’s Fully custom-created X-Back harness is built with your canine companion's well-being in mind. The padded Polartec fleece is placed strategically, allowing your dog the ability to easily pull from the full length of his body. 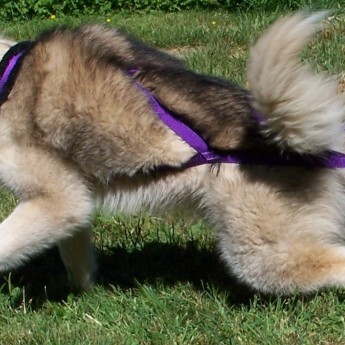 Alpine Outfitters knows that not all dogs are made the same, and that is precisely why they offer to custom create your new dog sled pulling harness to fit your dog. Bonus: Personalize with your choice of color, and a free ID tag! ​The majority of harnesses reviewed herein have been based on fun activities you can do with your dog, however, every once in awhile, you don’t want your dog pulling. The last time your furry friend dragged you down the sidewalk you promised to look into a safe and comfortable dog pulling harness that would give you the control you need. Enter Red Dingo’s Designer Harness: Cute, and extremely functional, it looks good and gives you the control you need with your overly-excited pooch. ​​Ruffwear has one of the largest selections of harnesses for your weight pulling pooch. Its Web Master Pro harness is explicitly created for the working dog in the field. Complete with pockets and outfitted with hardware that will withstand the harshest weather, it is ready to go to work with as much dedication as your canine rescue dog. This dog weight pulling harness was created as a “lift and assist” harness to fulfill the needs of the professional avalanche and other search and rescue teams. ​If you and your dog have recently taken up skijoring, or canicross, this is the harness for your team. Ruffwear wins again with the best harness for dog-powered activities Bikejoring and skatejoring are a great way to get out of the house with your dog and get active, and this harness has you covered where it counts! It is created to work with your dog as it learns its newest joring activity, and can be adjusted as he progresses in his training. When deciding on a weight pulling harness for your dog, take the time to seek out the experts in the industry and select the harness that fits the sport, and your dog the best. When it comes to weight pulling activities with your dog, remember to keep comfort and safety in mind, and you and your dog will be on your way to a very rewarding bonding experience. An awesome comparison, I go the Canine Equipment Ultimate Pulling Dog Harness and it’s working great for us.